Alright America, what are we outraged with today? Well, Roseanne - a Marxist mind you, gets her career destroyed over a tweet simply because the premise of her show aligned with the MAGA crowd. Tommy Robinson - a Nationalist Extremist, gets jailed for filming the defendants of an ongoing trial which violates fascist British Law. And Samantha Bee, a giant progressive, calls Ivanka Trump a "C You Next Tuesday" because she posts a picture of her holding her son. And the only one not held accountable was the Progressive. Shocker, another case of "Democrat Privilege", eh Hillary Obama? 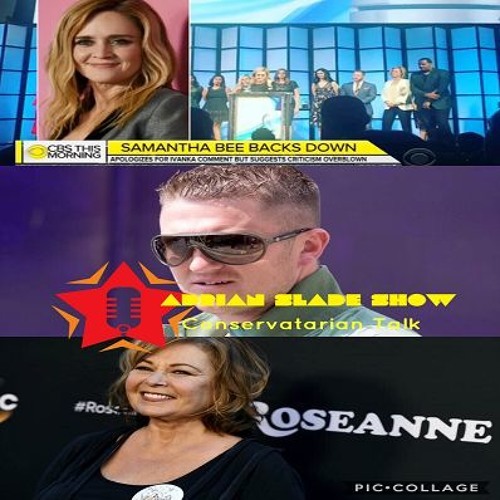 Follow on Twitter - @rantsoutloud Check out the Podcast on iTunes, Soundcloud, Stitcher, Spreaker, Google Play Music, Tune-In App, iHeart Radio Get the Free Adrian Slade Show ROKU Channel Please Donate to support the show, if you'd like at https://www.patreon.com/AdrianSladeShow You'll get exclusive early screenings of the show, before they air on Talk America Radio and Before their made public. You also get subscriber only exclusives - additional quick rants and the Adrian Slade Music Matinee Podcast.